I have an esteemed colleague, Ross Pruden, who kicked off Dimeword, and moderates @infdist, an online panel (#infdist) espousing the Internet-powered ethos of Infinite Distribution. Upon reading his blog lately, I came upon an insightful TED talk by Johanna Blakley, who outlines how the intentional lack of intellectual property protection in the fashion industry actually stimulates creativity and increases sales. Her thesis postulates that hoarding creative work stagnates imaginative thinking, both in the market and in the studio. Joysticks and paddles and games, oh my! 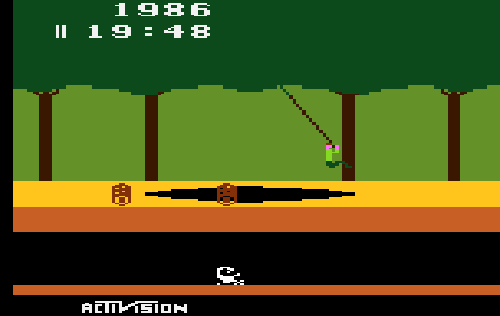 Which lead me to thinking about the great Atari debacle of 1983. If you’re my age, you may remember the Atari, or perhaps Atari 2600, video game system. It was boss. Asteroids: addictive, Pitfall: superb. 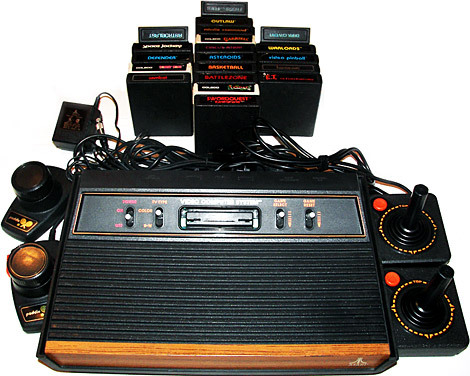 Atari was founded in 1975 by Nolan Bushnell (inventor of Pong) and Ted Dabney. In their time, Atari became synonymous with video gaming. By 1982, Atari was a cash-cow subsidiary of Warner, under poor management, and unwittingly precipitating a video game market bubble burst. Atari released a one-two punch of video game lemons, Pacman (Which sucked, but I could deal with it) and E.T., which was mystifyingly terrible. The E.T. game had no obvious objective or continuity. Atari rushed the production of E.T. to get it on game store shelves in time for Christmas. The game was so bad nearly every copy was returned, both to retailers and to Atari. To E.T.’s credit, the game did have an end, completing the metaphorical computer game circuit. Each quest object in the game that E.T. has to collect is the same shape, a small black lump. Children were supposed to know they were assembling a telephone. No text queues or speech in the game, mind you, in addition to the vague, disjointed sets. The game exhibited minimal RPG and puzzle solving forms, but the interface lacked any intuitive, integrated context in which the character-player could coherently interact. Now that I reflect on how bad E.T. was, it showed a real disdain for, not just ignorance of, the video gamer on Atari’s part. By 1983, speculative market practices deflated Atari’s value, costing Warner half a billion (with a “b”) in losses. Good guess if you predicted that Warner sold Atari shortly thereafter. Ah, the salad days of pixelated vine swinging. 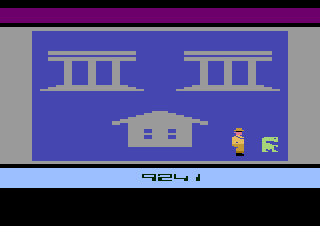 For me, the real zinger in the great Atari debacle of 1983 is the aftermath. Atari had about 5 million worthless E.T. video game cartridges storehoused, not to mention the unsold overproduced millions of Pacman cartridges. In the end, Atari buried millions upon millions of video game cartridges and consoles in a New Mexico landfill. To prevent looting or scavenging, the products were crushed with steamrollers, and concrete was poured over the remains. Economically and ecologically, a pretty grim move. At least if they’d erected a building over it, the extravagant demise of the plastic could have been useful and symbolic. Pac Man. Blarg, but playable. When thinking about the paradigm shift of infinite digital distribution, that concrete cartridge crypt sticks with me most. In some ways, Atari’s cartridge burial speaks to exactly what is overgrown and outdated about the ethos behind traditional analog distribution models. Let’s start with the cartridges. Aren’t you glad that phase is over? Whew, when I think of 12 million plastic containers, each molded to house one tiny gameplay circuit board with one tiny bit of computer data stored on it, my mind rejects the proprietary counter-intuitiveness of it all and screams: DOWNLOADS! DOWNLOADS! Today those hulking truckloads of millions of packages of games could be manifest as one simple hyperlink to a downloadable file. Admittedly, E.T. was so bad that almost everyone who bought the game, eventually returned it. But maybe that just means that no one wanted to pay for the game. A lot has changed since 1983, and a lot has not finished changing. Let’s take a moment to examine the thought process that may have informed steamrolling those games and pouring concrete over them. So: Atari had so many unwanted games that they felt they couldn’t even give them away. The question I have is: Did they even try? Unable or unwilling to imagine giving their fans and customers something for free, Atari underwent the expense of transporting, destroying, and laying a hasty concrete foundation over millions of perfectly intact products, not just E.T. game cartridges, but other returned games and entire Atari gaming consoles. At the time, Atari justified this by saying they were developing a new game system, the 5200 (which bombed), requiring a new generation of cartridges. Another report from Atari said they buried the games in concrete for safety. Whose safety? Get this, for the safety of the children who might loot the pile, because there are dead animals down in that landfill. Again, Atari considered it a better move to spend money destroying and hiding something that had already cost them a fortune, rather than considering letting people have it. When I think of 5 million copies of a bad game, I’m thinking: Party favors! A potentially loyalty-building commodity! Recycle! Give it to whoever wants one! For free! Build your name recognition, so when you put out a good product, folks want to buy. Admittedly, E.T. was so bad that almost everyone who bought the game, eventually returned it. But maybe that just means that no one wanted to pay for the game. Again I ask, Did they even try to give it away? I guess they just wanted people to forget about it. Well, that backfired, because the great Atari debacle of 1983 lives on in legend and history. I think, as poor as E.T. was, Atari could have given it away as a promotional sample, enthusing that any subsequent games you buy are going to be even better. When the kids complain that the game doesn’t make any sense, tell them they’ll understand when they’re older. Because E.T. and, to a lesser extent, Pacman failed at price-inflated retail outlets, Atari deemed them valueless, and painstakingly destroyed them. They did not take into account the kind of notoriety that they may have garnered by giving the games away to kids who were jealous of their Atari-having friends. Free Atari consoles and games? For a large segment of the gaming population, a free game, even a bad one, can be an excellent gateway drug. Like I said, a lot has changed. Today, we consider the availability of free content from an artist or software developer as given, the cheese that leads us further into the product maze. If you are making video games, music, movies, stories – any digitally transportable art – people have come to expect some of it for free, just to make sure you’re serious. The sacred commodity is not the elusive, individual product itself, but the creator’s imagination, which keeps making and making more content. In the digital infinite distribution model, people are paying for access to the creative imagination, the personality, who can produce desirable content, not the cartridge. This entry was posted in Art and Artists, Technology and Culture and tagged creativity, free content, games, intellectual property, technology. Bookmark the permalink. There was no cement, nor was anything crushed. They just threw everything into a landfill. What they threw away wasn’t worth the cost of storing it. Thank you for the elucidation. Do you think there may have been anything to gain by giving them away?